Although it’s not clear if builder Jay Bramhall just liked the bright colors (or maybe M-Tron), given the time of year I prefer to think that he got into Christmas spirit with this colorful Vic Viper. The ship conceals a sweet feature, namely the sweeping wings which are geared together and activated by turning the engine. The clean color blocking brings a nice pop of color to the drab regions of space, and Jay incorporates both old and new shades of dark grey to give a hint of the weatherworn nature of this craft. Vic Viper or Thicc Viper? It is the start of December and that means my favourite month project is over. That does not mean, however, that we have stopped featuring recently built Vic Vipers, as you can see here. It seems NnoVVember is attuned to lazy builders, and that means most entries, including mine came in the last week (and apparently there is a wide-spread belief that November has 31 days…). A very unique part of this group is Jussi Koskinen‘s Baryon Vic Viper. I have been participating in the annual NnoVVember project for the past few years and it has always been a blast. This year is no different, although I admit I could be more imaginative than milking the retro train tracks used in all of the portruding elements of the spaceship. I have gone a different direction than previous years, when I avoided the characteristic Vic Viper tail fin – this time I have embraced the theme and decided to make an especially prominent tail. The build started out with the wings and tail, then continued on with a body to connect all the wings together. The body is based on the lime tail pieces with blue hull built over it, a Bionicle Kanohi mask as the “wind”screen and grey technical details on the bottom. In reality it is quite a simple build, save for the integration of curved elements. Most of all, with contests, displays and projects flying from all directions, it was nice to build a creation just for fun, without stress. 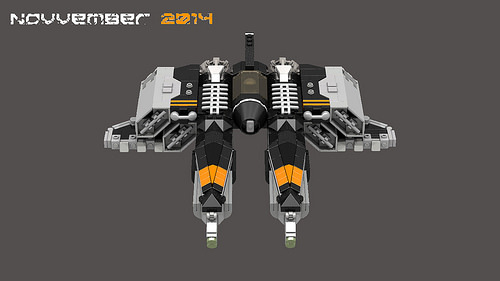 NoVVember is an annual LEGO building event — a celebration of the Vic Viper spaceship style. It’s been a fixture of the LEGO calendar for years now, so it takes something genuinely different to stand out from the Viper crowd. 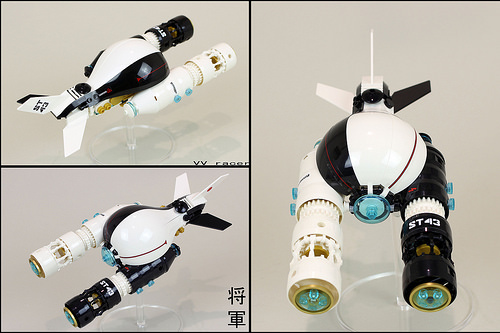 This interesting spaceship from Shamisenfred does exactly that, with striking colour blocking and imaginative use of hot-air balloon pieces. 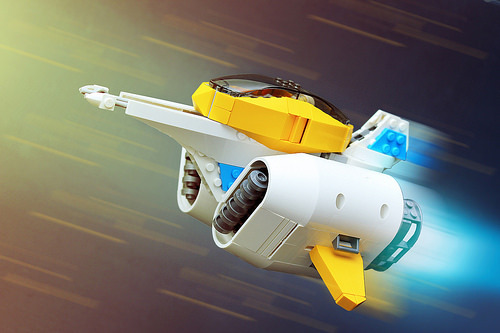 The excellent building continues beyond those eye-catching elements — don’t miss those engine nacelles, the little splashes of gold, and the smart use of stickers. I only wish the photos had been taken against a grey backdrop rather than white — it would have provided a far better contrast to the model. November, more so in the northern hemisphere, is a month of foggy mornings, rainy days and… Vic vipers? Indeed, every year the LEGO community on Flickr celebrates the most popular standardized spaceship format in the LEGO fan circles. While people have different views on what a Vic Viper should be and what they like or dislike about it, we still have dozens of these sleek spaceships swoosh through NoVVember every year. This year does not seem like it will be any different, so expect many more Vic Vipers on The Brothers Brick in the next few weeks. “Seraph” is one of such aggressive, fast looking spaceships we all love and Sam Malmberg‘s contribution to the 2017 NoVVember project. It uses a very pleasing colour scheme with nice contrast in its front prongs — not only contrasting in colour, but in style too, giving a bare-bone alternative to the otherwise smooth and streamlined areas. The cockpit deserves some attention too; not only has Sam achieved a nice bulbous effect with combining two different windscreen pieces, but the insides contain some neat details too. 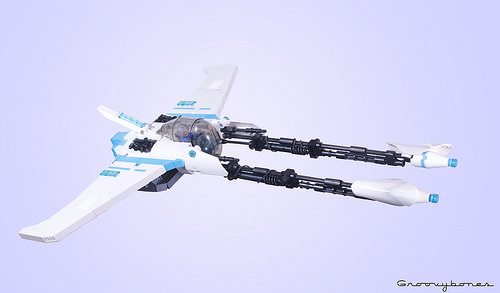 LEGO Vic Vipers tend toward the sharp and angular, with sleek lines and sharp corners. Each design must meet strict requirements epitomized by the late Nate “nnenn” Nielsen. Not so with this bulbous affair by Tyler Clites. Tyler’s Vic Viper has enormous, rounded engines — with frying pans as intake vanes, no less — and stubby little wings, with bright, childish colors. But it’s no less a legitimate Vic Viper than Nick Trotta’s Serrated Night. 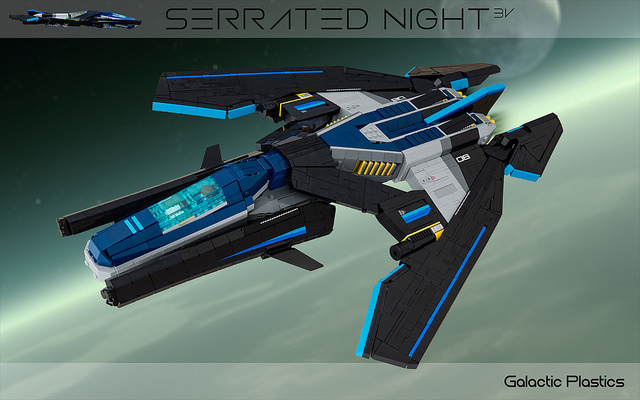 Master of spacetastic angles Nick Trotta has outdone himself with his latest LEGO spaceraft, dubbed the Serrated Night. 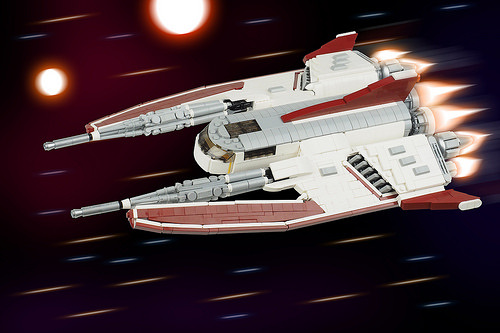 Indeed, this ship looks like it would cut through the dark night of outer space with stunning precision. 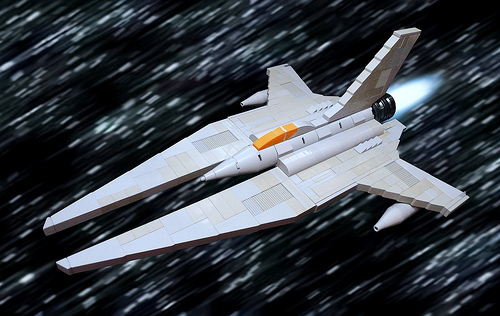 Nick says that he took inspiration for this Vic Viper from the anime Yukikaze and the F-117 stealth fighter. 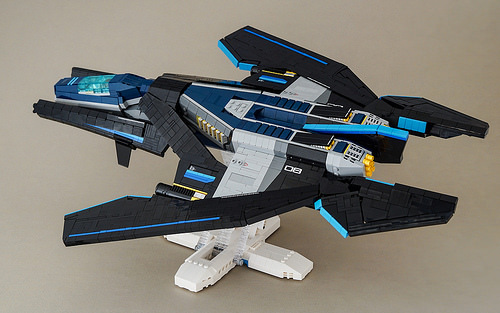 Black is a notorious color to build with and successfully photograph, but Nick uses lines of blue along the wings’ edges and presents the ship against a planetary atmosphere to offset the black. Nick also says that this is his largest ship to date, which has enabled him to incorporate lots of fantastic details, from judicious use of LEGO ingots to peeping yellow studs. Maschinen Krieger + Vic Viper = Maschinen Viper? Vic Krieger? LEGO mashups are always an interesting affair. They can go so wrong so fast, but occasionally you’ll find a mashup build so good it even puts its famous parents to shame. 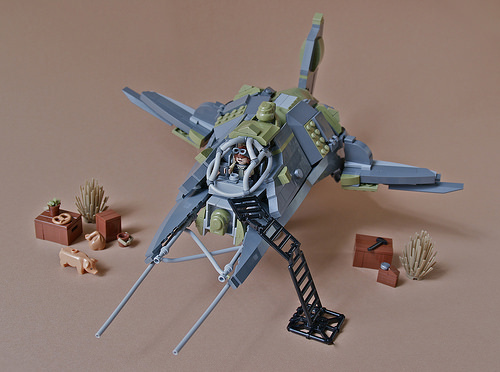 Take for instance this creation by Nooroyd, who blended together two of the most popular themed month building styles — the Maschinen Krieger style from Ma.Ktoberfest and a Vic Viper from Nnovvember — to form the ultimate VV Ma.K. vehicle. 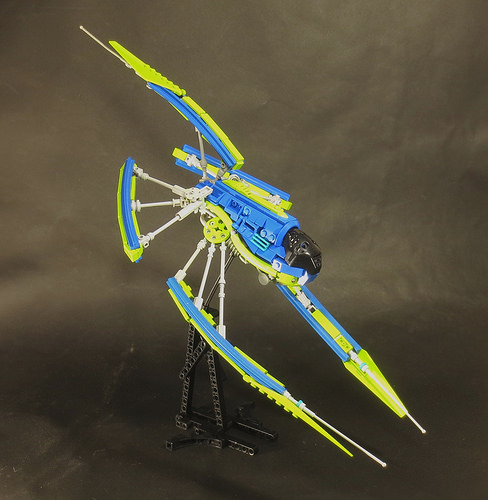 Nooroyd’s theme-blending created a stunning vessel — one with eye-catching techniques, such as the use of multiple minifigure helmets, flex tubes, and even an entire Dewback! 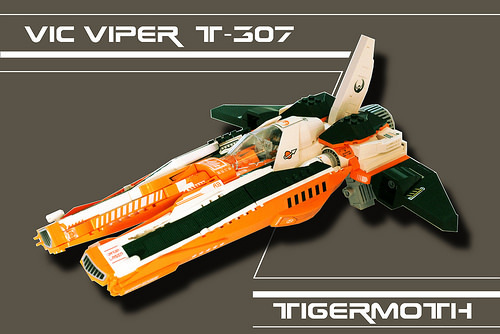 This crazy cool Vic Viper version by Rancorbait is chock full of sweet angles and great color blocking. The builder deftly applies some of the new angular slopes LEGO’s been producing in recent years, and the result is spectacular. I particularly love the clever use of this piece down the front of each side, which is so well integrated that I almost didn’t notice it. 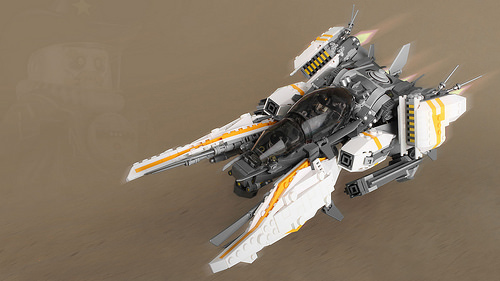 Overall, this ship looks like a combination of something from Tron: Legacy and LEGO’s own classic Blacktron theme. It’s that time of the year again when Vic Vipers flood the LEGO fan communities. 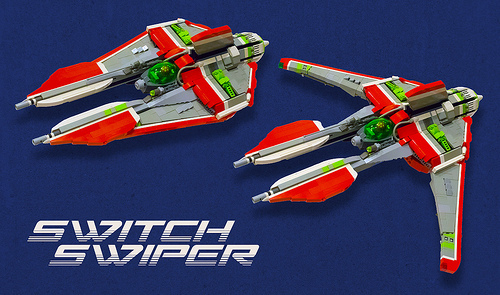 A good spaceship will never get old though, and Zach’s Vic Viper version looks superb. I particularly enjoy the clever placement of the fins on the sides of the cockpit, altering the shape of the visible windscreen. This drop-dead gorgeous example of a Vic Viper is full of win. Nick V. has orchestrated something quite nice here. I love the color scheme and how the details pop from the center section. But most of all I love the use of the various blades all over this ship. It’s probably the ‘Castle’ guy in me, but it really rocks! This ladies and gentlemen is a Vic Viper. Need I say more? Well I suppose I should at least add that this masterpiece was built by Nate Decastro. That is a proper job Nate!